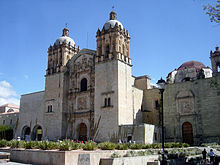 The Church and former monastery of Santo Domingo de Guzmán (Spanish: Templo de Santo Domingo de Guzmán) is a Baroque ecclesiastical building complex in Oaxaca, Oaxaca, Mexico. The complex includes a substantial sanctuary and an extensive system of courtyards, cloisters and rooms that formerly constituted the monastery. As its name implies, the church and monastery were founded by the Dominican Order. Begun in 1575, they were constructed over a period of 200 years, between the 16th and 18th centuries. The monastery was active from 1608 to 1857. In the period of the revolutionary wars, the buildings were turned over to military use, and from 1866 to 1902 they served as a barracks. The church was restored to religious use in 1938, but the monastery was made available to the Universidad Autónoma Benito Juárez de Oaxaca. In 1972 it became a regional museum, and in 1993 the decision was taken to undertake a full restoration. This was completed in 1999. It is an exceptional example of conservation architecture. The architect responsible was Juan Urquiaga. The rooms that formerly constituted the monastery now house the Cultural Centre of Oaxaca, which was founded with the help of Oaxacan-born artist Francisco Toledo. This museum includes an important collection of pre-Columban artefacts, among them the contents of Tomb 7 from the nearby Zapotec site of Monte Albán. The former monastery garden is now an ethnobotanical garden, containing a large collection of plants native to the region. The entrance to both church and museum is across a wide plaza that acts as a center for local fiestas and other entertainments. It is located about half a kilometre north of the central squares of the city, the Zócalo and the Alameda, and the connecting street is pedestrianised, so it is a popular place for both tourists and local residents to stroll. The former monastery garden, now maintained as an ethnobotanical garden. ^ a b "Iglesia de Santo Domingo". LonelyPlanet.com. Retrieved 2010-08-30. ^ Kuntz, Laurie. "25 Reasons We Love Oaxaca". Budget Travel Magazine. Archived from the original on 2008-05-16. Retrieved 2010-08-31. ^ Gross, Jamie. "Oaxaca: Authentic Mexico". Town and Country Travel Magazine. Retrieved 2010-08-30. ^ "Jardín Etnobotánico in Oaxaca". LonelyPlanet.com. Retrieved 2010-08-30.